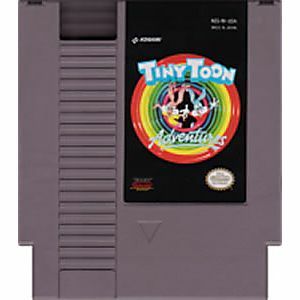 Tiny Toon Adventures original NES Nintendo Game cartridge only - Cleaned Tested and Guaranteed to Work! perfect game, in great shape. thank you!! A classic masterpiece from Konami. It is fun, good challengue and more. Don't miss it in your nes collection! Super fun game! Hours of fun!! I gave it four out of five stars, because only a handful of games, i.e. Mario 3, etc. deserve 5 stars in my book, but this one is a HIGH 4 stars! No complaints here at all!! Can play as Buster, and change from time to time to Plucky, Dizzy, or Furball! Furball I have found to be the most useful, as he can climb over stuff and find short-cuts thru stages! Surprisingly challenging as the game goes on, so I will enjoy this one for quite a while I'm sure! This game rocks and has elements of both Super Mario World and Castlevania like stages. The music is good too. Very fun too play and came in good condition! Can't stop playing the game. Just as fun as Mario bros. This was the first video game that I ever beat so it has a place in my heart for that reason. Nostalgia aside, this game is pretty fun. It's a little easy but it controls well and doesn't really have any big flaws. It's a good platformer with the Tiny Toon characters. What's not to love? 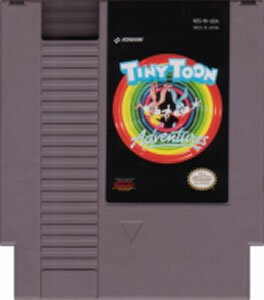 I love Tiny Toon series, so i love this game =D It's very very funny! 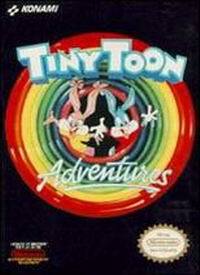 Tiny Toons is a good fun side scrolling game from back in the day. You get to choose between several different TT characters and also a secondary character that you switch between during the levels. All in all it is a fun game a worthy addition to an NES collection. Woorked good, Shipped Quickly, really cute game. wish it had a save feature.